You’ll need salted caramel for this recipe. Preheat the oven to 150°C, grease and line a 1L loaf tin with baking paper. Set aside until needed. For the caramel, place the castor sugar and water in a saucepan over medium heat. Allow the sugar to melt, increase the heat to high and bring the sugar to a boil, without stirring and cook, 8 - 10 minutes or until mixture is golden. Remove from heat and, once the bubbles have subsided, pour into the loaf tin. Allow to cool. For the custard, beat the 4 extra-large eggs, 2 egg yolks and the sugar, until light and creamy. Place the milk, fresh cream, vanilla seeds and salt in a medium saucepan over medium heat and simmer until hot, but not boiling. Whisk the hot milk mixture into the egg mixture. Strain the custard through a sieve and pour into the prepared loaf tin. Place the tin in a deep baking tray lined with a folded tea towel and pour enough boiling water into the tray to come halfway up the sides of the loaf tin. Bake, 1 hour 15 minutes or until the custard has set. Remove the loaf tin from the baking tray and allow to cool, 5 minutes. Refrigerate, 2 hours or until chilled. Carefully run a knife or spatula around the edges of the tin and turn the custard out. 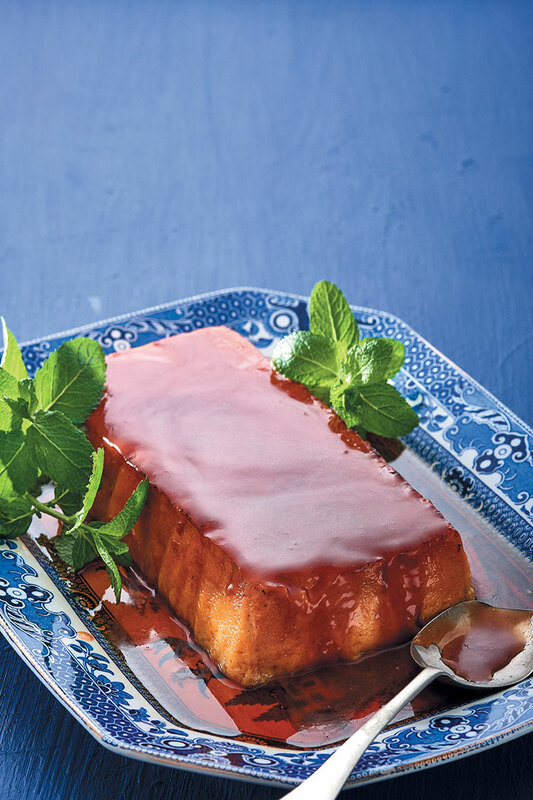 Drizzle the salted caramel over and serve garnished with fresh mint leaves.